Since the global demand for green chemicals increases, succinic acid revealed its large potential for a variety of applications. This dicarboxylic acid can be converted to a huge amount of different green chemicals of industrial value. The market for succinic acid is estimated at €2.5 billion (and rising), with uses in products such as antifreeze liquids, coolants, solvents, pigments, plasticizers, polyesters and intermediates for the chemical industry such as N-methyl-2-pyrrolidon, tetrahydrofuran, polyurethanes, butyrolactone, 1,4 butandiol… Among the named purposes, the production of a succinic acid based bioplastic: polybutylene succinate (PBS) is promising to have the highest rate of economical growth. Polybutylene succinate – which derives by polymerization of succinic acid and 1,4 butandiol – can be thermoformed in standard PP (polypropylene) processing equipment. PBS has many favorable properties like biodegradability, thermal and chemical resistance. It has an excellent processability, and can therefore be processed into melt-blown textile fibers, multifilament, monofilament, flat, and split yarn, and also into injection moulded products. Currently, 35,000 tons of succinic acid are processed annually. Estimations predict a rise to 2,000,000 tons per year in 2020. Traditionally, succinic acid is synthesized by catalytic hydrogenation of maleic acid which is of fossil origin. Consequently, its cost has been relatively high and linked to the increasing price of fossil fuel feedstocks. Bio-succinic acid is produced by fermentation of starch or oligosaccharides (C-5, C-6 sugars) containing renewable resources. Fermentation is commonly performed by bacteria, but yeast has been used as well for the production of this green chemical. To exploit the economic potential of bio-succinic acid and to get prepared for the rising market demand, several companies are currently involved in R&D, pilot plants and large scale production. Among the biggest players in this field is a joint venture called BioAmber. In 2008 ARD (Agro-industrie Recherches et Developpements) and DNP Green Technology formed this JV with the intention to generate commercial activities involving the technology for producing succinic acid of vegetable origin and all its derivatives. Meanwhile in 2010, DNP Green Technology acquired all shares in Bioamber from ARD. And ARD has become a shareholder of DNP Green Technology. DNP officially changed its name to BioAmber Inc. In 2009, BioAmber and Sinoven Biopolymers Inc. have signed an agreement which makes BioAmber the exclusive supplier of biobased succinic acid, enabling Sinoven to produce renewable modified polybutylene succinate plastic (PBS). Sinoven will also manufacture modified polybutylene succinate (mPBS) in China using Bioamber’s bio-succinic acid. In Februar 2010 DNP acquired Sinoven. 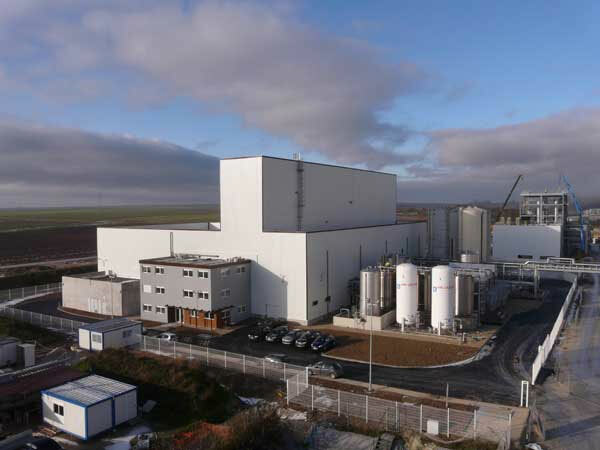 The company successfully commissioned its biobased succinic acid plant in Pomacle, France with an annual production capacity of 2,000 metric tons. The facility is producing succinic acid from wheat-derived glucose. Sinoven will use this bio-succinic acid for the production of PBS derived coffee cup lids, cutlery, stirrers, disposable razors, cosmetic packaging, etc. Bioamber has licensed certain technology from US chemical company DuPont regarding production of bio-succinic acid derivatives. DuPont will not be involved in any marketing under this deal but has a right of first refusal to secure off-take from future commercial plants. Bioamber has chosen Japanese chemical trading firm Mitsui & Co. to distribute their bio-succinic acid throughout Asia. In March 2010 BioAmber announced cooperation with GreenField Ethanol to build a bio-succinic acid refinery in Ontario, Canada that will produce deicing solutions. Recently, in January 2011, it was reported that BioAmber is developing a new generation of microorganism for the fabrication of bio-succinic acid under exclusive license from Cargill. This microorganism is supposed to reduce manufacturing costs by 25%. As soon as this microorganism fits commercial requirements, BioAmber plans to use it on all of their commercial plants. At present, two more facilities in North America and Asia with an annual production capacity of about 30,000 tons each are planned. Myriant Technologies LLC was formed in June 2009 by BioEnergy International LLC to incorporate all of its biobased chemicals business and intellectual property. The firms proprietary fermentation technology has been proven through the commercial production of D (-) lactic acid. In November 2009, the company, which has piloted the bio-succinic acid process successfully, announced an alliance with Uhde for the engineering, procurement & construction (EPC) of Myriant’s biobased succinic acid plants. Myriant has been selected by the U.S. Department of Energy (DOE) to receive up to $50 million for its planned biobased succinic acid facility in Louisiana. Construction of the facility will begin in early 2011 and last for 18 month. This new 392,000 square-foot plant at the Port of Lake Providence will be the world’s largest biobased succinic acid plant. After the scheduled start of operation in 2012, the project will produce up to 30 million pounds (about 13,600 tons) per year of succinic acid, using sorghum and carbon dioxide as feedstocks. This month, January 2011, Myriant announced the closing of a $60 million strategic equity investment from PTT Chemical Group (PTT Chemical), Thailand’s largest petrochemical producer. The investment includes the signing of the Head of Agreement for the establishment of a joint venture between PTT Chemical and Myriant for deploying Myriant’s technology in Southeast Asia. Update March 4th: Myriant Technologies and Davy Process Technology (Davy), a Johnson Matthey company, announced that they have signed a Memorandum of Understanding covering the use of succinic acid as a bio-derived feedstock for the production of butanediol, tetrahydrofuran and gamma-butyrolactone. The MoU covers two areas of co-operation between Myriant and Davy, first the non-exclusive testing and approval of Myriant’s product succinic acid as a feedstock to the Davy process and second an exclusive Joint Development Agreement with the purpose of integrating the Myriant bio succinic acid technology with the Davy butanediol technology to minimise the cost of recovery and purification of the succinic acid for the production of bio Butanediol. The Mitsubishi Chemical Corporation is the manufacturer of a broad variety of different chemicals like performance products, health care and industrial materials. Within the sector of industrial materials MCC produces sustainable materials like PLA (poly lactic acid), Bio-PE (biobased polyethylene), Durabio (durable bioplastic) and polybutylene succinate which is distributed under the trademark: GS Pla. Currently, MCC produces GS Pla from petro-based succinic acid in Japan and markets it worldwide. MCC has also developed a process to produce succinic acid made from biomass resources. A deal with Thailand based PTT Public Company Ltd. was signed for the production of its GS Pla using low cost resources as feedstocks to enter new markets. The production of around 20,000 tons per year will start in 2015. DSM, the Netherland based life sciences and materials company, and Roquette Frères, the global starch and starch-derivatives company in France, have signed a joint venture agreement for the production, commercialization and market development of bio-based succinic acid. Since 2008 the two companies have been working together to develop a fermentative technology to produce bio-succinic acid. A demonstration plant in Lestrem (France) was built in 2009. A scale-up to full commercial industrial production is intended for 2011 – 2012. In 2009 BASF Future Business GmbH and PURAC, one of the world’s biggest PLA producers, announced their cooperation for the development of the production of biobased succinic acid. Both firms have been working on the development of the industrial fermentation and down-stream processing of biobased succinic acid. Unfortunately, since 2009 neither a progress in technology nor any further development or plans have been reported. If YOU (the one reading this article) have any information, please let me know. At present, the companies involved in bio-succinic acid are just a few. But for sure, as market demand rises, a growing number of firms will enter the stage to this profitable green chemical.